Are you looking for Gray Squirrel Control in NJ? ALCO Animal & Pest Control offers prompt, professional and safe Gray Squirrel Control in NJ since 1995 for many satisfied clients. Whether it is residential or commercial Gray Squirrel Control , ALCO Animal & Pest Control will solve your Gray Squirrel problem in no time. Our trained and experienced NJ Gray Squirrel Control technicians are qualified to handle a variety of Gray Squirrel situations and can rest assure to restore your normal life, keep you, your children, or your employees safe and keep you in line with state and local animal laws. 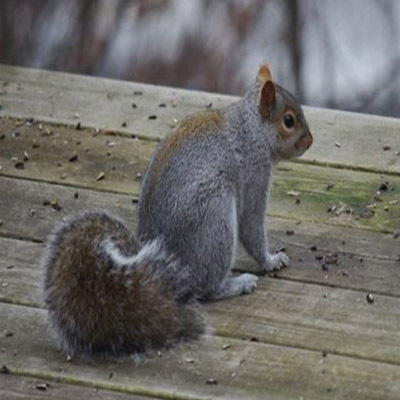 ALCO Animal & Pest Control uses environmentally friendly Gray Squirrel Control products as well as humane Gray Squirrel Control methods to keep you and your children safe while performing the Gray Squirrel Control job. Our knowledgeable pest technician will answer any questions you may have and explain to you every detail you need or want to know about the job. We are always friendly and we are here to help. In New Jersey they usually cause problems for people during spring and winter times. From fall through winter (September through February) are the times when "denning" activities take place. Denning is when squirrels make attics their homes and it's usually eight to ten squirrels.In the spring time (March through May) breeding takes place to raise their young. During this time typically it's when you find a female and her offspring in the attic or in the wall. They can have one litter per year, usually in the early fall. Its fur is predominantly gray with a touch of red sometimes and the belly is white. They have a large bushy tail. In urban area of eastern area of New Jersey albino and melanistic (darker squirrels) are found. This animal is the type that picks up all the left food where ever they find it and stores it in small caches to recover later. This is done to just have dibs on it and later on they return to restore their food in a more secure area. They build their nests in the forks of trees. These consist mainly of dry leaves and twigs. There are times when they will attempt to build a nest in the attic or exterior walls of houses to have more shelter usually for their young. They have also been known to dig up bulbs from gardens. Their reputation for these habits has led some to call them "tree rats" or "rats with fuzzy tails". Predators include hawks, skunks, raccoons, snakes and owls. On occasion, this squirrel may lose part of its tail while escaping a predator. Why Are They Damaging My Property? They den in attics, walls, sheds, barns, and chimneys, annoying people with their noise and odors. Squirrels usually gain access via overhanging branches, power lines, or by climbing up the siding. They may fall into chimney and furnace flues, thus gaining entrance to the basement or interior of the house. Their nest materials might block a vent, making it a fire hazard. They chew and scratch wires (another fire hazard) and also damage attic vents, eaves, screens, bird feeders, siding, insulation, household goods, and the tubing used for maple syrup production. They run along power lines and sometimes short out transformers. Squirrels also eat garden, field, and orchard crops; bird seed; and newly planted vegetable seeds. They'll strip the bark from trees, especially fruit trees and cedar. Alco Animal & Pest Control provides full removal and control services in NJ. We are more than happy to inform New Jersey and out of state visitors on these and other species that (might) cause dangers to their health. We offer great advice and solutions because we are well certified and informed when it comes to animal control and the safety of animals in New Jersey, that is our main priority.